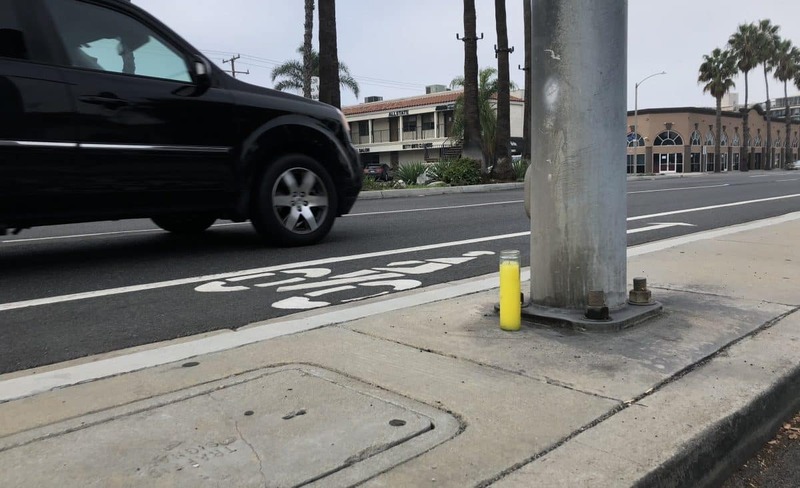 A single candle stood on Monday, Oct. 29, 2018 in Naples, near where a 22-year-old Cal State Long Beach student was killed by a hit-and-run driver a day earlier. Photo by Jeremiah Dobruck. The 22-year-old woman killed by a hit-and-run driver early Sunday in Naples was a Cal State Long Beach student who was held in high esteem by her classmates. Alena Rey Gretencord studied design at CSULB, according to her father, Scott Gretencord, who was on campus Monday to collect some things and talk with her instructors. Classmate Jillian White said Alena Gretencord was full of energy, love and enthusiasm. Police said Alena Gretencord was walking on a center median along Second Street near Tivoli Drive when she fell into the eastbound lanes of Second Street around 1:30 a.m. Sunday. “The suspect vehicle was seen stopping before continuing eastbound, colliding with the victim and fleeing the scene,” police said in a news release. She was taken to a hospital where she died shortly before 3 a.m., according to the Los Angeles County Coroner’s office. Alena Gretencord grew up mostly in Anaheim before graduating high school and heading off to CSULB, according to her father. “I allowed my daughter a lot of independence because she was a very smart, independent person,” Scott Gretencord said. At the campus, she started pursuing graphic design classes before pivoting to something more tangible—industrial design, according to her father. “She started off as graphic design and wanted to step it up to produce things that people would actually use,” he said. Police are still looking for the car that hit Alena Gretencord. They said it was a white Ford F-150, with a silver toolbox in the bed and possibly a company decal on the driver’s door. They asked anyone with information about the crash to call investigators at 562-570-7358.